Gracious Hospitality: Hats! Hats! Hats! I used to love my grandmother's hats! She always wore a hat when she went to church or other dress-up affairs. I considered them so old-fashioned and interesting! For grandmother, they were normal and required for proper attire. Somewhere in my distant memory I also remember my mother buying my sister and me new hats each Easter so we could wear them to church, but that tradition faded when we became about 8 or 9 years old. Over the years I've developed a new appreciation for hats, and with my Red Hat tea now a memory, I've been thinking about hats again. 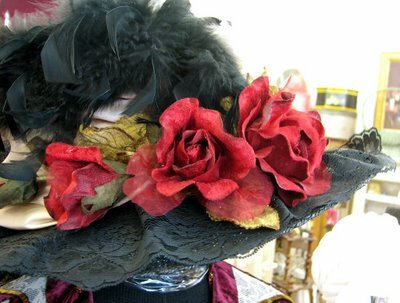 This lovely black and red hat was made by a shopkeeper at an antique store I visited recently. Red paper flowers decorate a hat abundant with black lace, beads, and feathers. Such fun to wear to dress-up tea or for a fun afternoon with friends. For more wonderful hats, how about visiting this link? I wish ladies wore hats more often today; they are so stylish! I just wanted to tell you how much I enjoy your blog. Your photos are wonderful and you talk about some of my favourite things --- tea, gardens and old-fashioned things. I also think we have a mutual friend, Gwen from Ohio, who is just a wonderful lady. I love hats and have a similar memory of wearing a hat on Easter Sunday when I was a young child (don't forget the white gloves either) and wish those fashion were still around. Again, thanks for doing a beautiful job blogging. It's a treat to come here and just absorb!